Like many of our users, we were very excited when Google Suggest was incorporated into Google.com almost a year ago. The feature provides real-time suggestions while you search. Today, we're happy to announce that we've enabled Suggest in all of our Google News editions in English, French, Italian, German and Spanish. The feature can make your experience searching Google News better by helping you formulate queries, saving you keystrokes, correcting spelling mistakes and exposing you to queries you might not have thought of. The goal of all that? To get you to the articles you're looking for as quickly as possible. 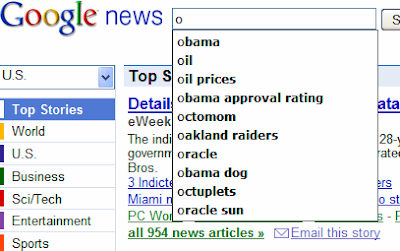 We are working on enabling Suggest in other editions of Google News, so stay tuned!